Artists participate in a Corpus Christi procession in Gallup, 2016. What do you picture when you hear the words “New Mexican Art”? A small artist colony nestled in the foothills of the mountains? The stucco and adobe square of Santa Fe, stuffed with shops and artisans peddling their wares on colorful rugs? Or maybe a bustling Indian Market, with just a hint of fry bread scent in the air? All of these are accurate, to be sure, but even the most die-hard art enthusiast may not be aware of a very special artistic tradition, passed down generation by generation from the first arrival of Spanish colonists. Arlene Cisneros Sena is a santera, a female artist who paints Catholic saints, or santos. She’s a master in a field of very specialized New Mexico artists whose families have lived in the state for hundreds of years. Most of them come from the northern villages near the Colorado border. Their art varies from painting to metalwork to sculpture, and each variation has its own old Spanish term – repohado, santos, retablos. At their core, each has one thing in common: they are outlets for the artist’s religious expression. Jerry Montoya is a master painter and tinworker, and he can tell you the history of each artistic method. 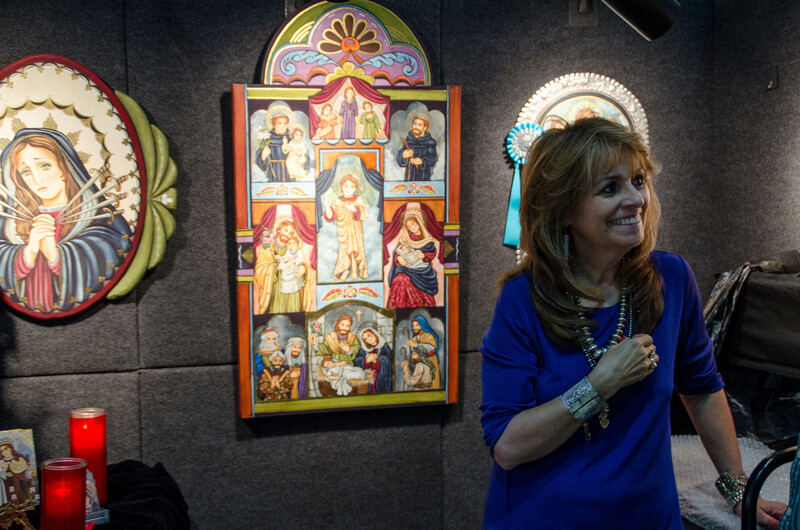 And for the past 20 years, he’s also been the main founder of the Spanish Market, an annual gathering of artists who specialize in Spanish colonial art. 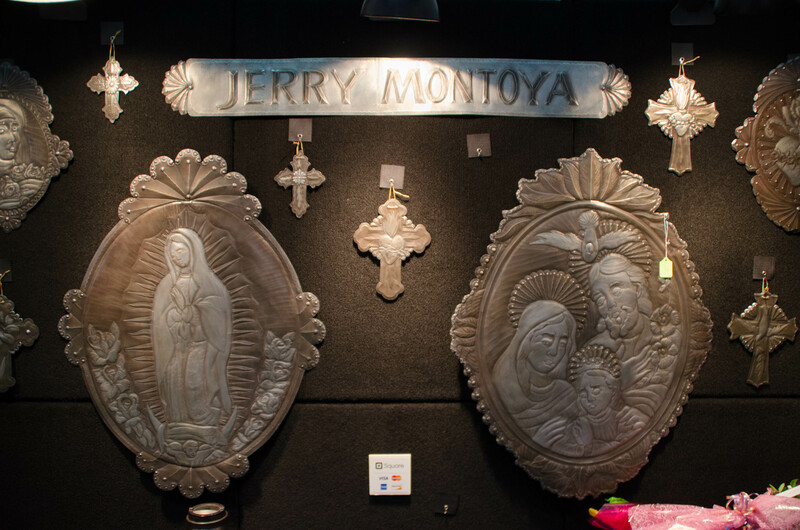 The tin work of Jerry Montoya. 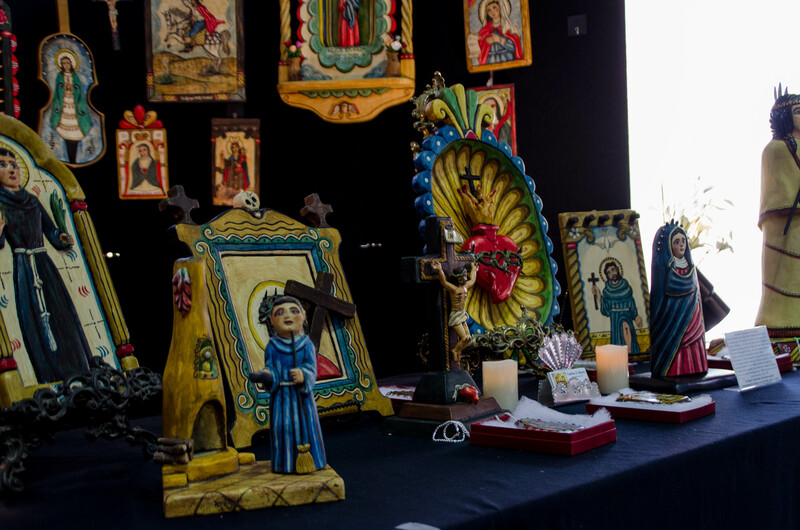 For the last two years, the Spanish Market has been held at Sacred Heart Cathedral in Gallup, and outside of a well-known cultural hub like Santa Fe, you’d be hard-pressed to find a bigger gathering of master artists and craftsman anywhere in New Mexico. Here, most of the artists continue to gather materials and construct their pieces in nearly the same way their ancestors did 300 or even 400 years ago. Montoya and Sena both describe the process of gathering natural plants and insects for dyes and paint. Other colors can only be gotten in certain seasons, or in ways that make you wonder how much time the original settlers had on their hands. Luckily for him and other artists, they don’t necessarily have to gather their own insects anymore, although Sena has experience with collecting the color from the bugs. 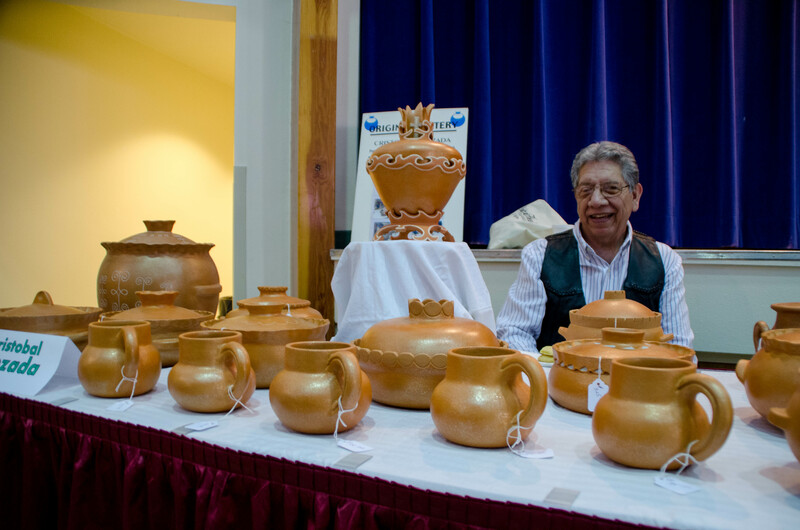 Cristobal Quezada specializes in micaceous pottery, and along with his wife, sits at a corner table happily conversing with attendees while they look over his pots, bowls and cookware. The clay he uses comes right out of the ground with mica, which gives off a sparkling sheen after being fired. Quezada never uses glazes on his pottery – only his fingers, a rough river stone, and an open fire pit. Most people buy his work to display, but he hopes they would use them in the kitchen. Micaceous pottery, as seen here by artist Cristobal Quezada, naturally fires with a sparkling, golden sheen, and requires no glazing. Laughing, his wife chimes in that it’s her job to “test” the pots by cooking with them, seeing which dishes give the best taste, and what kind of heat works best for the cooking. It’s obvious that she is bursting with pride for her husband, and with a twinkle in her eye, mentions that all the pots that don’t sell “become mine eventually”. This pride in the work, the process, is evident with all the artists, no matter the medium. For them, it’s not just a hobby or a job – it’s a way of life, a way to express and live a tradition passed down and honed over the years into something not quite Spanish, not quite New Mexican, but a combination of both. Sena didn’t come to santos painting until later in life; her first paintings were landscapes. But now that she’s found it, she can’t see herself doing anything else, and she tries to spread her love of the artform to everyone she meets. 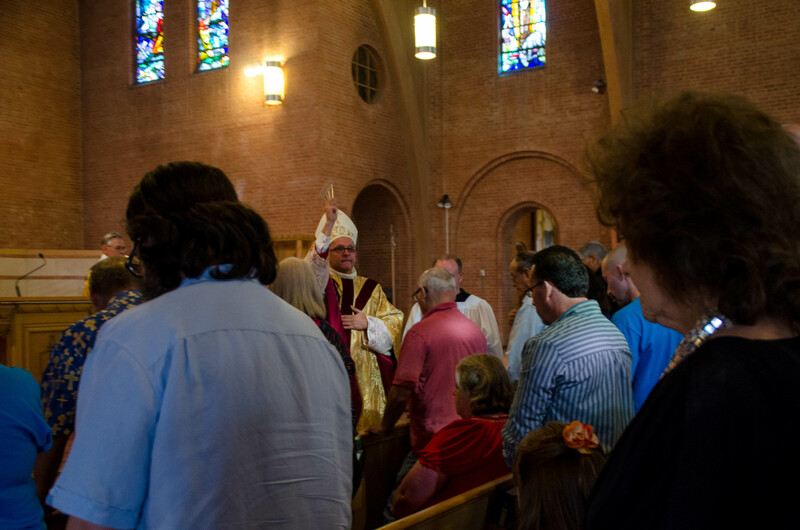 Bishop Wall blesses the Spanish Market artists at Mass. As Jerry Montoya watches the artists in the market he’s worked so hard to build, he too reflects on the historical aspect of the artwork. For him, and for the craftsman who are maintaining these traditions, the work is personal, honed through the spiritual and creative work of generations.